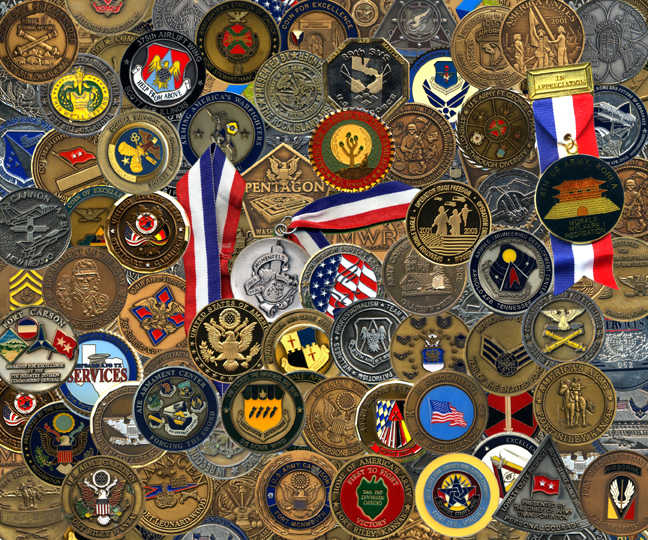 These Commander Challenge Coins & Medallions are presented in recognition of special achievement. We have received hundreds of these and we hold each one in great honor and esteem. 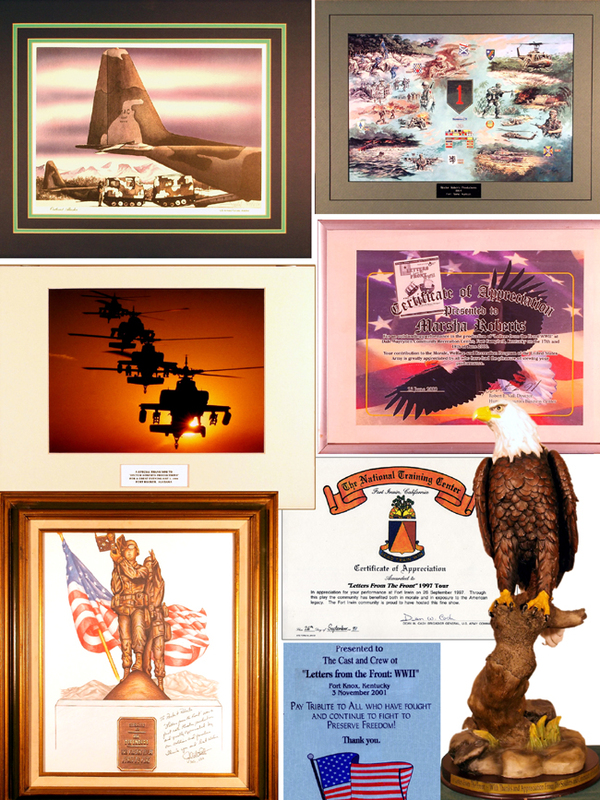 Our sincere thanks to the Base Commanders around the world who presented them to us. Nobody is more dedicated or works harder to fulfill their mission with honor, bravery and integrity than the men and women of America’s Armed Forces stationed in the U.S. and abroad. We try to show our appreciation for them by putting on a show that is both entertaining and meaningful. Nothing less than our best effort is good enough for our troops. It is gratifying to have the military respond to us with such warmth, kindness, and encouragement. They never hesitate to take us into their communities with open arms. After the show we often receive standing ovations and are presented with Commander Coins, plaques, certificates of achievement, and other awards. These now number in the hundreds and we are proud of each and every one. Because of this, Letters From The Front holds the distinction of being The World’s Most Decorated Play. Left: Letters From The Front Producer Marsha Roberts receives an award from the Ft. Leonard Wood Base Commander. Right: Stars Neil Matthews & Della Coles receive a very special award after a show in Seoul, S. Korea. 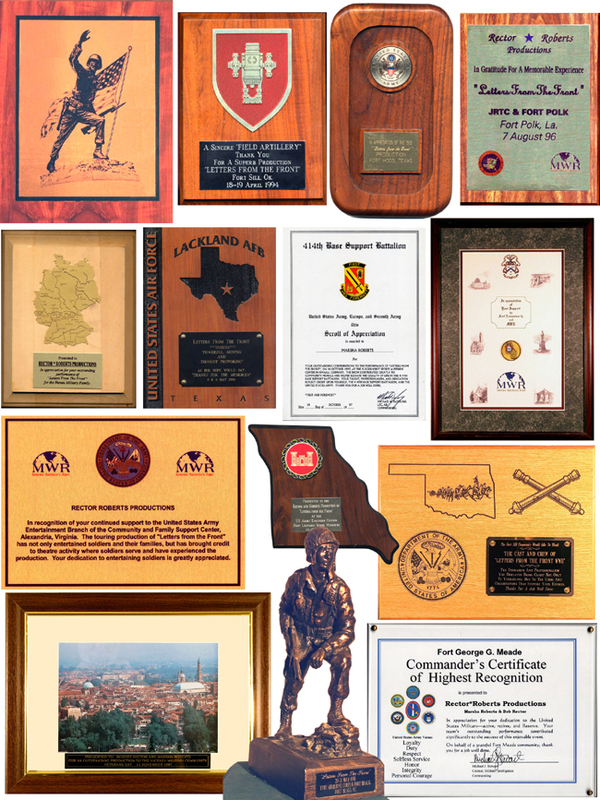 These are just some of the plaques and certificates on our “Glory Wall.” As can be seen, the effort and creativity that went into their design and creation is indicative of our military’s attitude of no job too small to do their best. 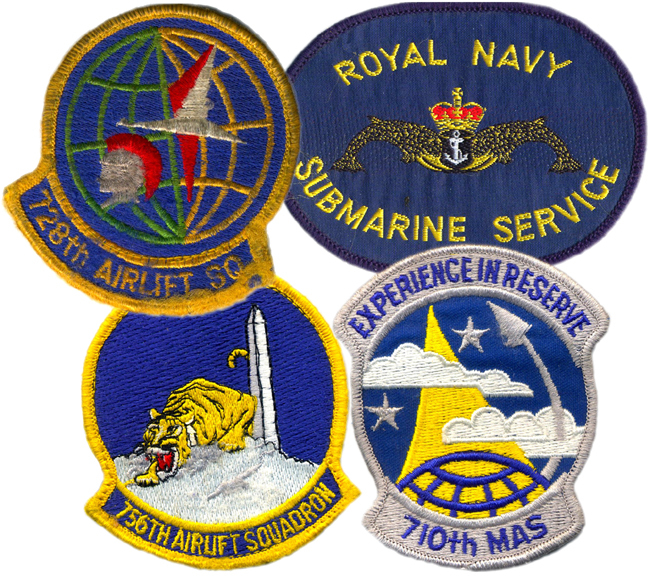 We’ve also collected a number of shoulder flashes over the years. These are just a few. 25 YEARS LATER AND LETTERS FROM THE FRONT IS STILL GOING STRONG! MEET THE NEW KATHARINE HARTGROVE & JOHNNY CHASTAIN!